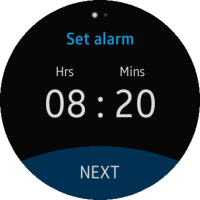 The Alarm sample application demonstrates how you can create a simple alarm application UI using the TAU (Tizen Advanced UI). 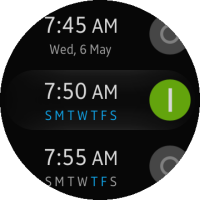 The alarm list uses the toggle 2-line list in the TAU. You can change the image for the on or off alarm button by customizing the relevant CSS file class. 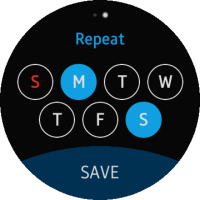 The indicator page that sets the alarm time and repeat period contains a TAU PageIndicator component. This application is only a UI sample, so there are no alarm functions. 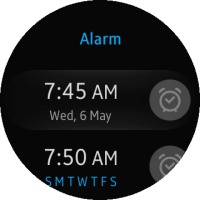 The following figure illustrates the main screens of the Alarm. css/style.css This file contains the CSS styling for the TAU (Tizen Advanced UI). index.html This is a starting file from which the application starts loading. It contains the layout of the application screen, the registered alarm list, and the layout of the indicator screen. js/animation.js This file contains the methods for the animation effect of the alarm list. js/app.js This file contains the method for common page functions. js/circle-helper.js This file contains the method for the rounded scroller effect. js/pageindicator.js This file contains the method for the indicator section changer effect. Create the main page (alarm list page). This page consists of a toggle 2-line list of TAU with a toggle button and 2 lines. 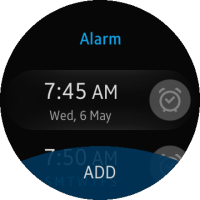 You can change the toggle images of the toggle alarm button in the alarm list. To change the images, use the ui-switch-input and ui-switch-button classes in the style.css file. You can also use your own images instead of the alarm_list_icon_bg.png and alarm_list_icon.png sample files. If you use the above source code, the footer button is always shown on the screen. Create the second page, which is used for adding alarms. You can also set the time and alarm repetition. This page contains a page indicator. When you use a page indicator, you can change the options, such as the number of pages, circular functionalities, and bouncing effect in the pageindicator.js file.